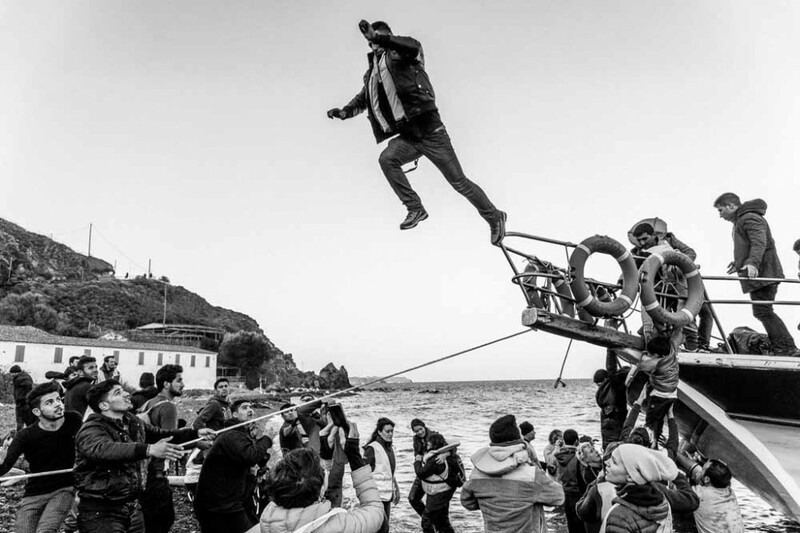 It’s halfway through November and the flow of refugees arriving in the Greek island of Lesbos hasn’t reduced. 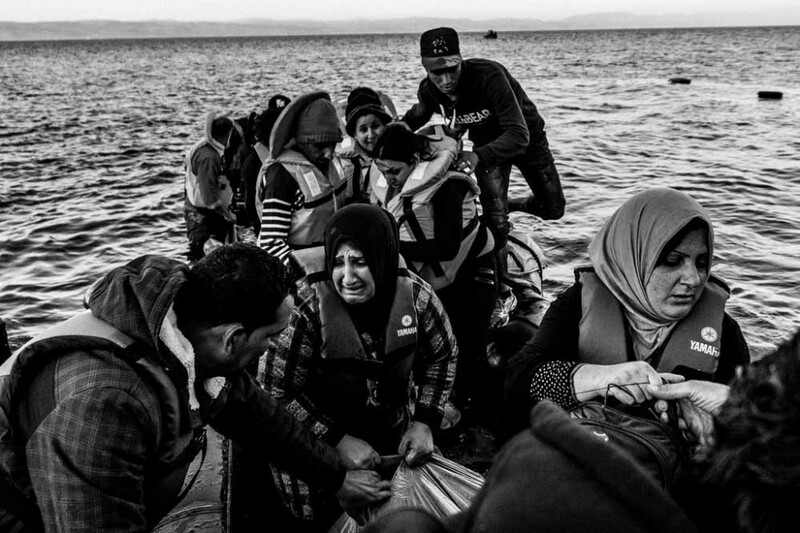 Scores of people risking the journey on rickety boats stream in from Turkey, crossing the Aegean Sea. Most of them arrive on Lesbos. On a clear night, if you’re standing on the side of Lesbos facing Turkey, you can see the lights of the cars driving down the hilly roads. More than eight lakh migrants and refugees have arrived in Europe this year, predominantly from from the Middle East and Africa. 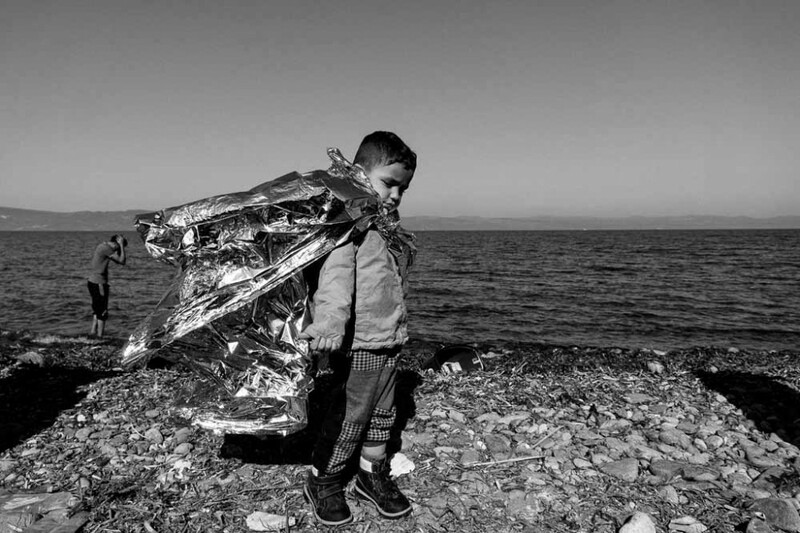 Over 2.1 lakh arrived in October alone, of which two lakh landed in the islands of Greece. Lesbos, a Greek island off the coast of Turkey with a population of 86,000, has become one of the main entry points to Europe. It is now crippled by the logistics of housing the arrivals, and more come every day. One of the challenges for the European Union is also to separate the refugees fleeing war and those migrating for economic benefit. The vessels that they arrive in are usually cheaply-made plastic dinghies with a few wooden planks and a low cost motor. Smugglers on the Turkish side select one of the passengers, teach him how to manoeuvre the engine, and point in the direction of Greece. 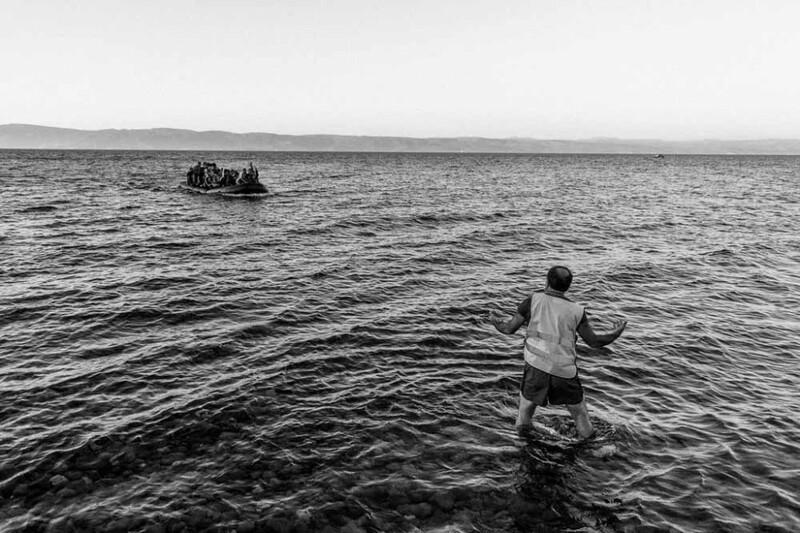 The boats are then loaded with two or three dozen passengers and set off for the Greek coast. The cost of a seat on each boat varies between €800 and €2,000 depending on the size, the make of the boat, and also negotiations with the smugglers. The amount pays for a seat and a small backpack. Large luggage is charged extra and costs about the same as a seat for a baby. Every week or so, sometimes several times a week, a boat will capsize, leaving small or no chance of rescuing the people on board. 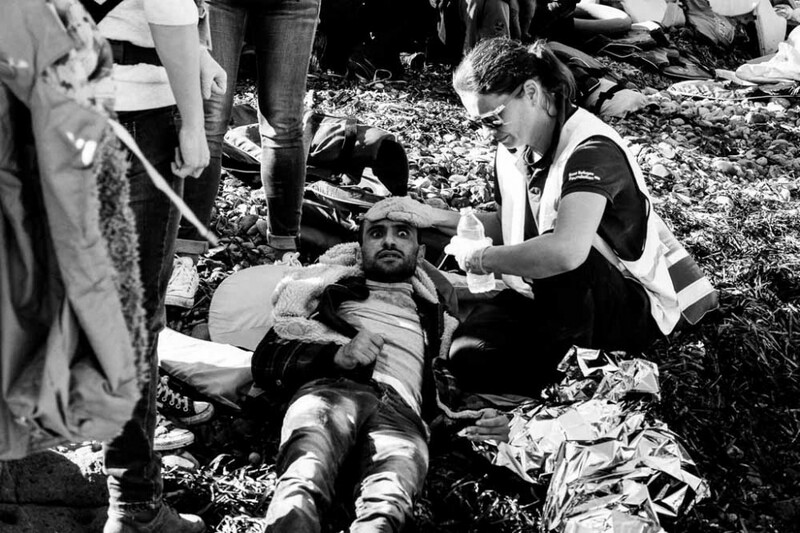 According the United Nations High Commissioner for Refugees, 3,440 people have died or gone missing this year while crossing the Mediterranean Sea to Europe, a number which has increased after several incidents of boats capsizing in November. For those who finally do reach, over a hundred volunteers from all over the world are waiting to receive them with thermal covers, water and food, before they start the trek of a few kilometres that will take them to the first registration camp. 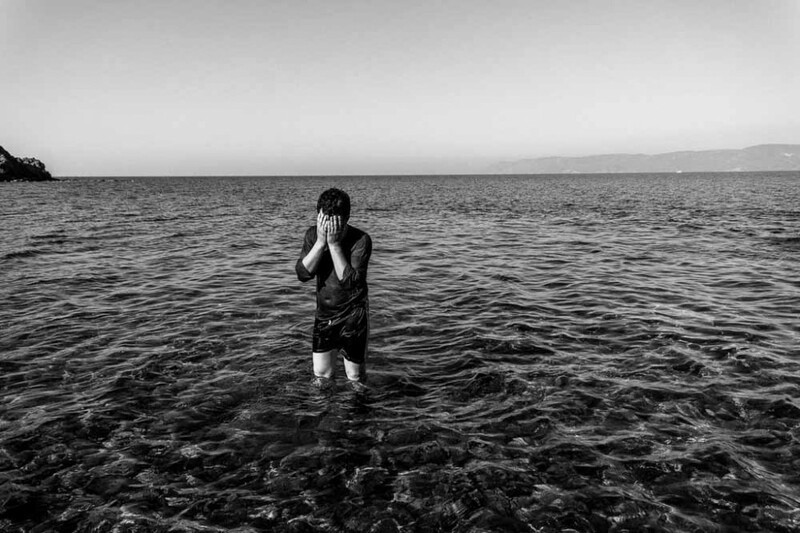 A young Afghan man holds his head in his hands with joy after reaching the shores of Greece. 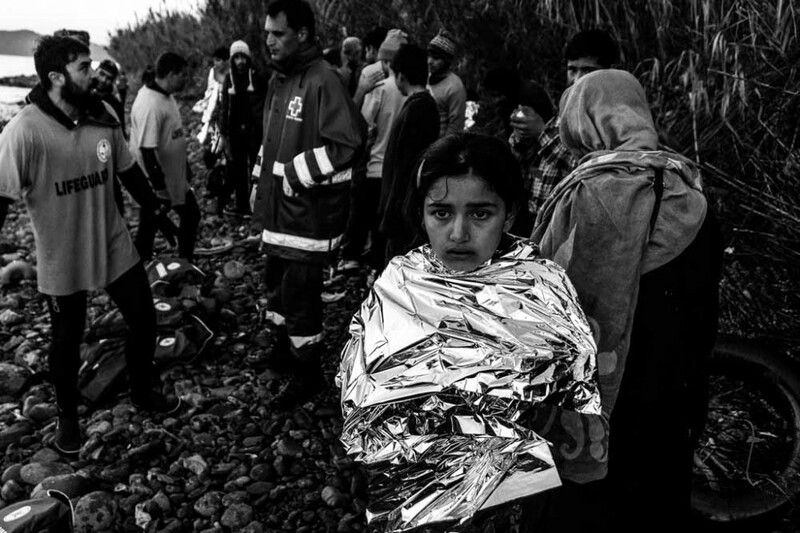 A young girl wrapped in a polythene sheet supplied by a volunteer looks back at the boats. 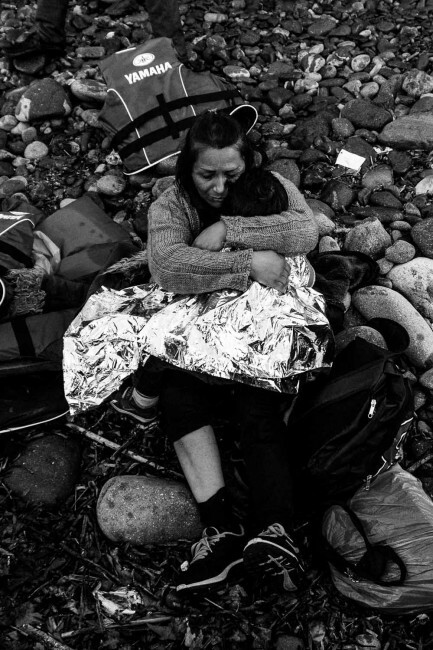 A woman cries and holds her baby on the beach of Lesbos. 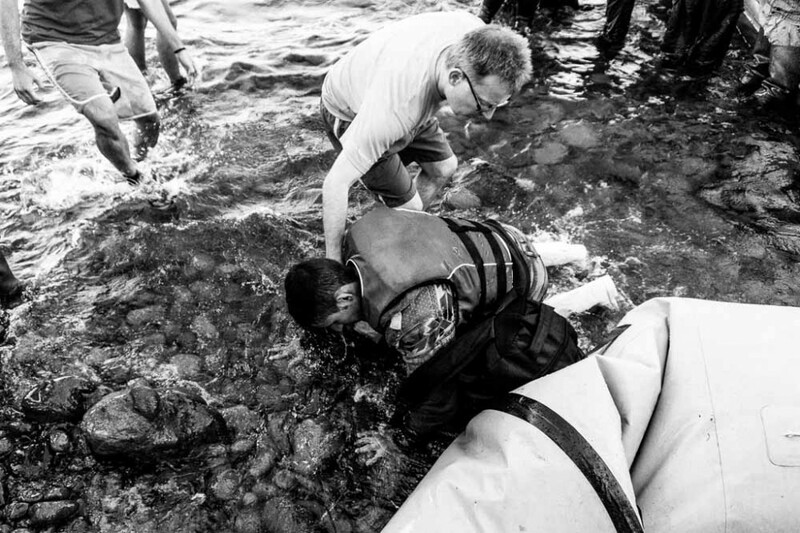 Volunteers help a man who has fallen to his feet after leaving his boat. 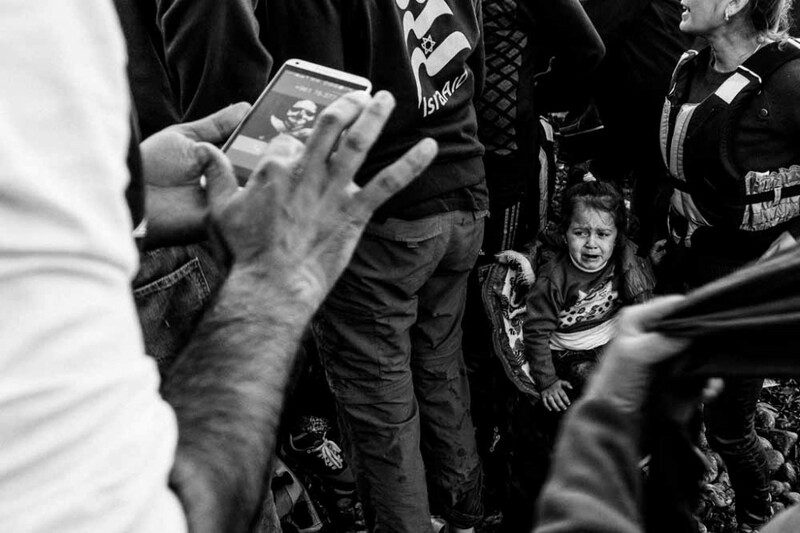 A girl cries from fear and exhaustion after the long journey to Lesbos. 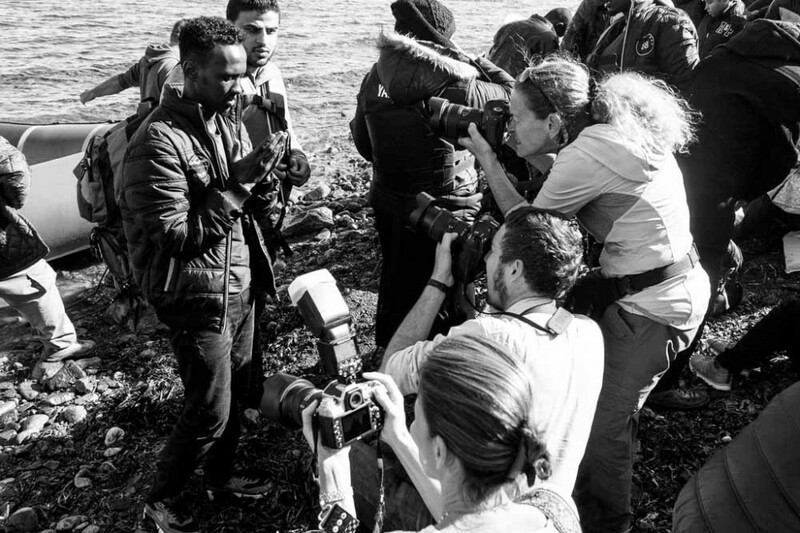 Journalists swarm around a young Muslim man in prayer. A child uses the polythene sheet he received from a volunteer as a cape. Women arriving on a plastic dinghy. Smugglers charge extra for any large luggage beyond one backpack. Volunteers wait on the rocky beach for boats to arrive, so they can direct the migrants on where to go. 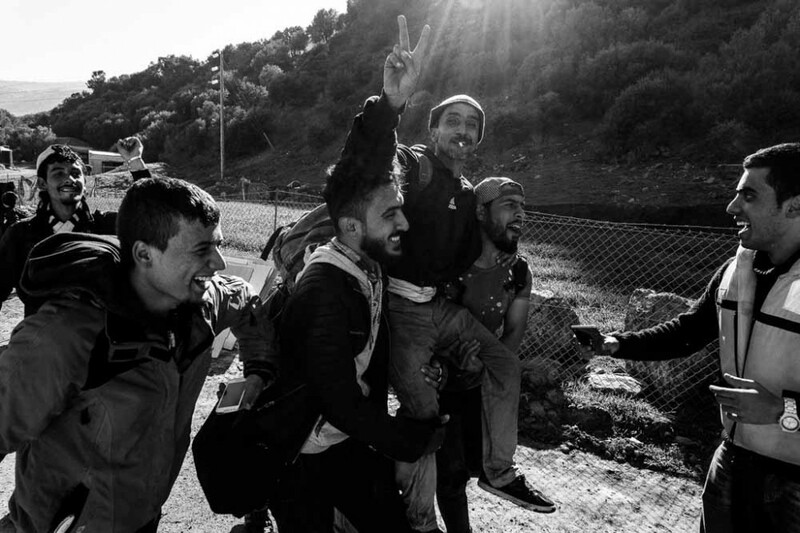 Migrants celebrate after reaching Lesbos, carrying on their shoulders the man who navigated their boat. 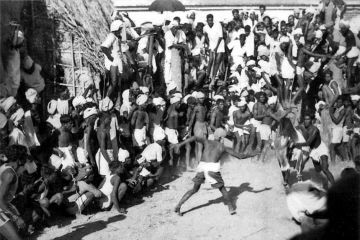 Volunteers attend to a blind man in shock. 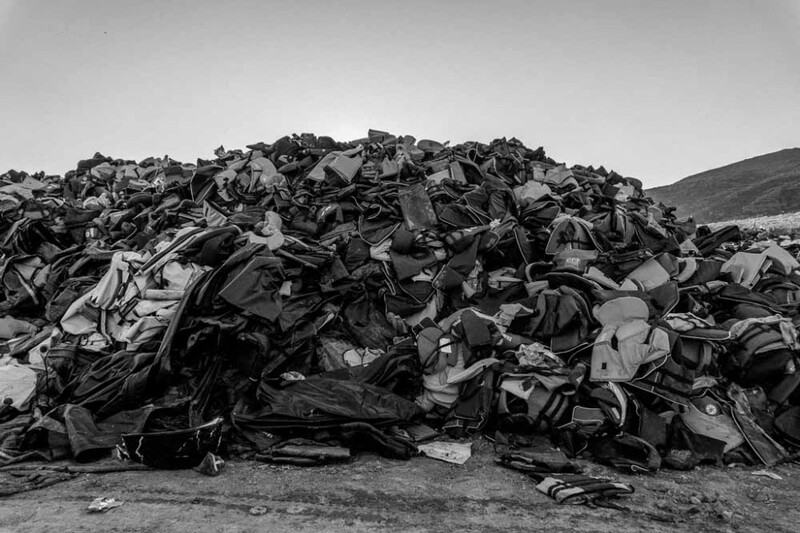 Mountains of discarded lifejackets piled in the junkyard on the island. 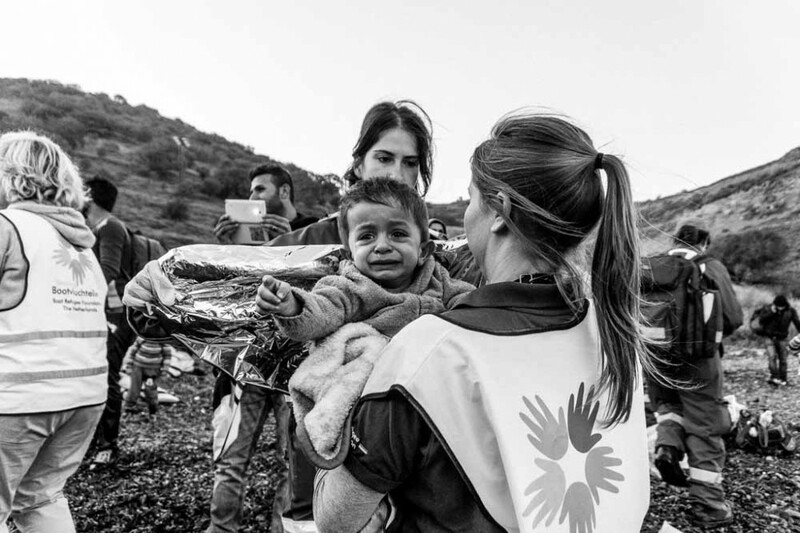 Two Dutch volunteers hold a baby boy crying and calling for his father who is getting off the boat. 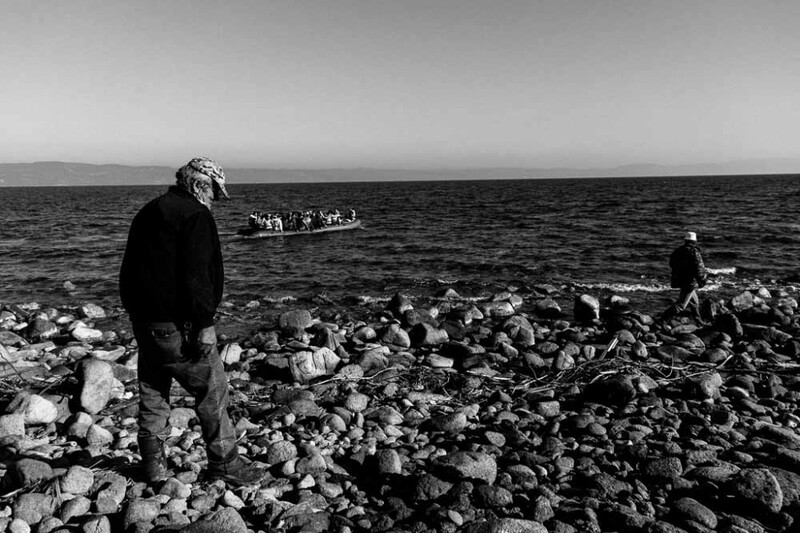 Refugees disembarking a wooden boat that brought them from Turkey to Greece. 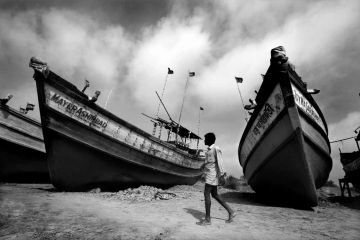 The fishing colonies of the Sunderbans. 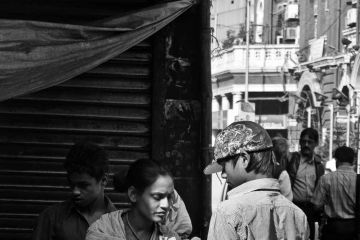 Three generations of a family condemned to life on a street corner.